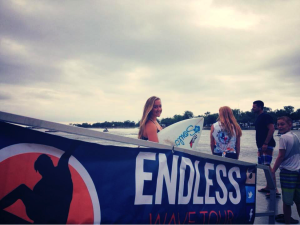 The Tige Boats Endless Wave Tour is a well-rounded wakesurf tour that offers awesome venues and relaxed competition environments which allow riders of all ages to compete and have a great time. The tour attracts many local riders in addition to the group of riders who travel to every competition. At each competition I was able to see riders of every ability level show their best tricks and it inspired me to push myself to become a better rider. I also had the opportunity to meet people from all over the country who share the same passion for wakesurfing that I have. Seeing all of our friends from different states and hanging out with them for the weekend has become my favorite part of every competition. The friends and memories I have made through the Endless Wave Tour will last a lifetime. I’ve become a part of a welcoming and supportive wakesurf community who help me grow in the sport and improve my riding.